Diverse and complex challenges in new venture formation demand rare and exceptional entrepreneurial acumen, particularly in technology-driven environments where disrupted markets amplify the factors and magnitude of uncertainty and risk. The successful technology entrepreneur (term of art for Strategic Knowledge Arbitrage and Serendipity (SKARSE™) enactors) is focused yet flexible, demonstrating relentless intensity of purpose while adapting that purpose under changing conditions. The distinguished entrepreneur accurately predicts events and conditions in advance for superior strategic positioning. We find that two terse descriptors - obsessed maniacs and clairvoyant oracles - encapsulate critical attributes conducive to superlative entrepreneurial posture, propensity, and performance to anticipate and recognize challenges and convert them into opportunities. In so doing, the entrepreneurs leverage strategic knowledge serendipity factors and practice strategic knowledge arbitrage competences. From the pre-market perspectives of R&D and innovation management through successful marketing and commercialization of engineered innovations, technology foresight and forecasting pivot on the entrepreneur's unrelenting persistence to pursue a vision and unclouded prescience of exactly what vision to pursue. To investigate our premise, we conduct comprehensive surveys and interviews with 33 founding entrepreneurs, comparatively analyzing their experiences against complementary data sources to develop personal profiles of critical attributes and behavioral characteristics. Employing qualitative analytic techniques, we find the data rich in empirical evidence to support a perspective of entrepreneur as obsessed maniac and clairvoyant oracle, plus many other intrinsic characteristics of personality, motivation, intention, and action that constitute the entrepreneurial actor. In the realm of social sciences, much business and economic theory is devoted to the construction of frameworks that describe complex organizational systems: the group, the firm, the industry, and the institution. Underlying these interdependent and concentric layers of business structure are individuals whose actions antecede and propel the formation of new business organizations. The precursive enactor is termed Entrepreneur. Each starting with a blank page, an idea, and the urge to proceed, individual entrepreneurial initiatives create organizations (firms) that spawn industries which in turn give rise to institutions. Complex business and economic systems are created, revised, destroyed, and replaced by the successive and evolutionarily execution of entrepreneurial ambition. Entrepreneurship encompasses a unique place in the spectrum of business management: maneuvering from zero to something - intentionally a functioning and preferably economically viable organization - and ideally one that can sustainably perform and thrive, even in the later absence of the founding entrepreneur after he or she has moved on. Multi-faceted challenges in new venture formation demand rare and exceptional skills and qualities of an entrepreneur, particularly in technology-driven environments where the forecasting and management of R&D and innovation amplify the factors and magnitude of uncertainty and risk. An entrepreneur's ability to predict the future or in fact to anticipate and shape via Strategic Knowledge Arbitrage (enlightened insights) and Serendipity (“happy accidents”) (SKARSE™) competences (Carayannis 2008a, b; Carayannis et al. 2011), or a relentless pursuit of such a self-assured vision, demands thinking and learning - indeed higher order learning and more specifically learning-to-learn and learning-to-learn-how-to-learn (Carayannis 2000a, 2000b, 2001, 2008a, 2008b, 2009, 2012; Carayannis and Sipp 2010a; Carayannis and Alexander 2002; Carayannis et al. 2006, 2011; Carayannis and Provance 2007; Carayannis and Kaloudis 2008) that is highly specialized and to a great extent aberrant because of the unpredictable and precarious proposition of starting a new business venture, particularly tenuous in technology markets, where competitive and environmental forces are markedly turbulent and stochastic. The successful technology entrepreneur acts as firebrand of cultural and socio-technical evolution in identifying and unlocking economic opportunities embedded in emerging technologies and kindling the markets in which these technologies commercially proliferate. In short, the technology entrepreneur in our emerging and empirically grounded theory behaves as SKARSE enactor. Of necessity, the entrepreneur is extremely focused yet flexible, demonstrating a relentless intensity of purpose while adapting that purpose with nimble dexterity as events unfurl and conditions change. Moreover, the distinguished entrepreneur will accurately predict events and conditions before they occur to permit strategic positioning of the venture for optimal advantage. We find that two terse descriptors - obsessed maniacs and clairvoyant oracles (OMCO) - encapsulate the critical attributes most conducive to superior entrepreneurial performance. This paper examines the OMCO factors that contribute to the new venture's fate, attributable to the entrepreneur as enactor of endogenous economic change and hopefully growth, independent of or in spite of myriad market challenges. Invention is a singular event, born of science, research, discovery, creativity, and serendipity; invention does not always impact or influence technology. Innovation is an interactive process; it is the cultivation of knowledge, materials, and methods into economic practice for improved competitive advantage, born of engineering, development, customization, evolution, plus science, research, discovery, creativity, and serendipity. Innovation is not just invention but an economically viable adaptation, improvement, or application of a technology via the exploration and exploitation (Carayannis et al. 1998) of ‘happy accidents’ and ‘enlightened insights’ (SKARSE™ in action) (Carayannis 1992, 1993, 1994a, b, c, 1998, 1999a, b, 2000a, b, 2001, 2004, 2008a; Carayannis and Alexander 1999, 2002, 2004; Carayannis and Campbell 2006, 2009; Carayannis and Chanaron 2007; Carayannis and Gonzalez 2003; Carayannis et al. 2003, 2006, 2007; Carayannis and Juneau 2003; Carayannis and Sipp 2006; Carayannis and von Zedtwitz 2005; Carayannis and Ziemnowicz 2007; EG Carayannis, 1998–2011, unpublished lecture notes; EG Carayannis, 2002–2009, unpublished lecture notes; EG Carayannis and MR Stewart, 2007–2011, unpublished lecture notes). Florida and Kenney (1990) describe invention as a technical breakthrough, while innovation is a commercial actualization. Hindle and Lubar (1986) view invention as the creative origin of a new process that enables innovation. Innovation in turn has a social, economic, and financial impact. Kline and Rosenberg (1986, pp 285–287) emphasize the recursive nature of the innovative process, discounting the linear model, “one does research, research then leads to development, development to production, and production to marketing,” and amplifying the reciprocating roles of science and knowledge in the innovation process, “…not only that innovation draws on science, but also that the demands of innovation often force the creation of science.” The products of scientific research in the laboratory and technological innovation in commercial markets form a feedback loop, with each driving the other, derived from each other. Innovation is a word derived from the Latin, meaning to introduce something new to the existing realm and order of things or to change the yield of resources as stated by J. B. Say quoted in Drucker (Drucker 1985). Technological innovation is defined here as a situationally new development through which people extend their control over the environment. Essentially, technology is a tool of some kind that allows an individual to do something new. A technological innovation is basically information organized in a new way. So technology transfer amounts to the communication of information, usually from one organization to another (Tornazky & Fleischer, 1990). The broader interpretation of the term ‘innovation’ refers to an innovation as an “idea, practice or material artifact” (Rogers & Shoemaker, 1971, p. 19) adopted by a person or organization, where that artifact is “perceived to be new by the relevant unit of adoption” (Zaltman et al., 1973). Therefore, innovation tends to change perceptions and relationships at the organizational level, but its impact is not limited there. Innovation in its broader socio-technical, economic, and political context, can also substantially impact, shape, and evolve ways and means people live their lives, businesses form, compete, succeed and fail, and nations prosper or decline. The literature on innovation describes several mechanisms in multiple categories whereby the trajectory of a technology S-curve is formed. Carayannis et al. (2003) offer a useful presentation of the forces and influences that define and shape the evolution of technology performance. At the beginning of an emerging technology life cycle, there is a discovery or invention that shows promise in addressing a social need or delivering a new technological capability. Emergence and early growth accelerate from this outset to maximum growth at inflection, which is shaped by the interplay of two forces: technology push (also called supply push) and market pull (also called demand pull). With technology push, producers devise and introduce new technology to the market, showcasing their ‘better mousetrap’, making a new solution available before demand is created. With market pull, consumers express unfulfilled wants and needs, urging for a better way of doing things, creating economic incentive for suppliers to provide a new solution. Later growth, diminishing after the maximum growth at inflection and leveling off at maturity (ultimately dwindling into obsolescence), is also shaped by the interplay of two converse forces antipodal to those in earlier operation: technology pull and market push (Carayannis et al. 2003; EG Carayannis, Carayannis 1998–2011, unpublished lecture notes; EG Carayannis and MR Stewart, 2007–2011, unpublished lecture notes). With technology pull, producers cannibalize old technology investments to sustain their returns and suppress disruptive innovations for as long as possible, perhaps until the fundamental physics upon which the technology is built reaches its natural limit. With market push, industry or regulatory standards, market alliances, and other societal constraints suppress incremental improvements. Notwithstanding the persistence of efforts to extend the plateau of technology maturity, obsolescence of the earlier technology is inevitable, effectively occurring when the technical performance per dollar (or the cumulative adoption) of the disruptive, radical newer technology exceeds the level of the older technology (i.e., the new S-curve crosses above the prior S-curve). Once these curves cross, there is a cascade of additional investment in the new technology, with resultant economies of scale and market adoption, steepening the emerging curve while hastening the decline and obsolescence of the mature technology. The critical determinant of emergence and growth of a technology is innovation. Innovation is the cultivation of knowledge, materials, and methods into economic practice for improved competitive advantage. It is the transformation of an invention generated by scientific activity into a socially usable product, changing economics from supply terms to demand terms and increasing the value and satisfaction obtained from resources by the consumer. To wit, innovation is the market actualization of better ideas (Carayannis 2009; Carayannis et al. 2003; Stewart 2011; EG Carayannis, 1998–2011, unpublished lecture notes; EG Carayannis and MR Stewart, 2007–2011, unpublished lecture notes). An entrepreneur is an agent of change: the seminal actor who conceives and implements a new business venture, impelling a new economic entity from ideation to functional reality. The entrepreneur assumes the risks of forming a business or enterprise, organizing and managing every facet of its emergence. T Åstebro and P Thompson (2007, Does it pay to be a jack of all trades?, unpublished manuscript) affirm that the entrepreneur must be a business jack-of-all-trades with substantive technical savvy and a project manager extraordinaire to also integrate systems in the 21st century commercial complexity. Interpreting Schumpeter (1942), entrepreneurship is the recognition and exploitation of opportunity - a recombinant or novel deployment of resources - the envisioning, planning, and implementing of mechanisms to create economic opportunity. Entrepreneurship seeks to shift the established means of economic creation and control, strategically reappointing economic resources from established pathways to innovative pathways (Stewart 2011, page 99). Drucker (1985, p. 21) underscores Say's most famously quoted adage, “The entrepreneur shifts economic resources out of an area of lower and into an area of higher productivity and greater yield.” This is achieved through technological innovation, the “specific instrument of entrepreneurship.” (Drucker 1985, p. 30). Heterogeneity dynamics: co-opetition, co-evolution, and co-specialization. Input heterogeneity refers to the variety and diversity of the key inputs to economic activity, namely, land, labor, capital, technology and entrepreneurship as identified by Adam Smith, Ricardo, and Joseph Schumpeter among others. Intrinsic in all these inputs is knowledge, which has been increasingly the key source of value adding of most human endeavors. Process heterogeneity reflects the variety and diversity intrinsic in the ways that the key inputs to economic activity are leveraged, allocated, re-combined and re-created as part of the processes of technology innovation and entrepreneurship aiming at the maximization of value added. 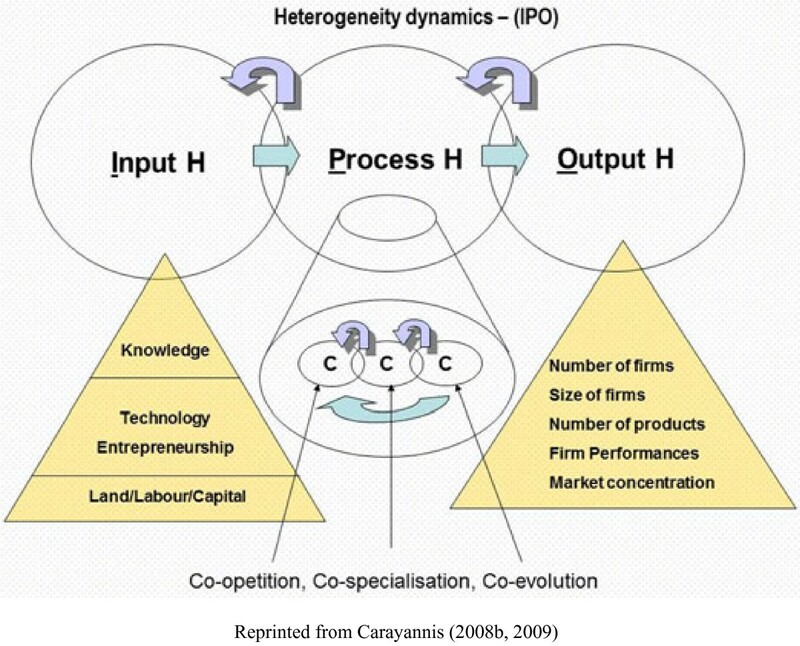 Output heterogeneity reflects the diverse ways and means that the value added of economic activity combining and leveraging the key inputs discussed earlier, is captured and exploited, namely, number and size of firms, firm performance, market concentration, number and rate of renewal of products and services, as well as public-private sector partnerships structure and performance, to name a few. Sustainable entrepreneurship: the creation of viable, profitable and scalable firms that engender the formation of self-replicating and mutually enhancing innovation networks and knowledge clusters leading towards what we call robust competitiveness. Robust competitiveness: a state of economic being and becoming that affords systematic and defensible ‘unfair advantages’ to certain entities. It is built on mutually complementary and reinforcing low-technology, medium-technology and high-technology public-sector and private-sector organizations (government agencies, private firms, universities and non-governmental organizations). The key success factors for sustainable entrepreneurship - one of the major pillars of robust competitiveness - are diagrammed to show the micro-level stages, drivers, and determinants of heterogeneity dynamics at Figure 2. Heterogeneity dynamics: the micro-level stages, drivers, and determinants. An entrepreneur's ability to assess innovative economic opportunity amounts to an aptitude for predicting the future (or this person's firm belief in possessing such ability). Relentless, self-confident pursuit of this vision represents specialized and exceptional thinking, learning, and decision-making. These factors are the distinguishing qualities of entrepreneurs that Carayannis (998–2011, unpublished lecture notes; Carayannis and Gonzalez, 12003) terms obsessed maniacs and clairvoyant oracles. This research is part of a larger qualitative study in grounded theory building. 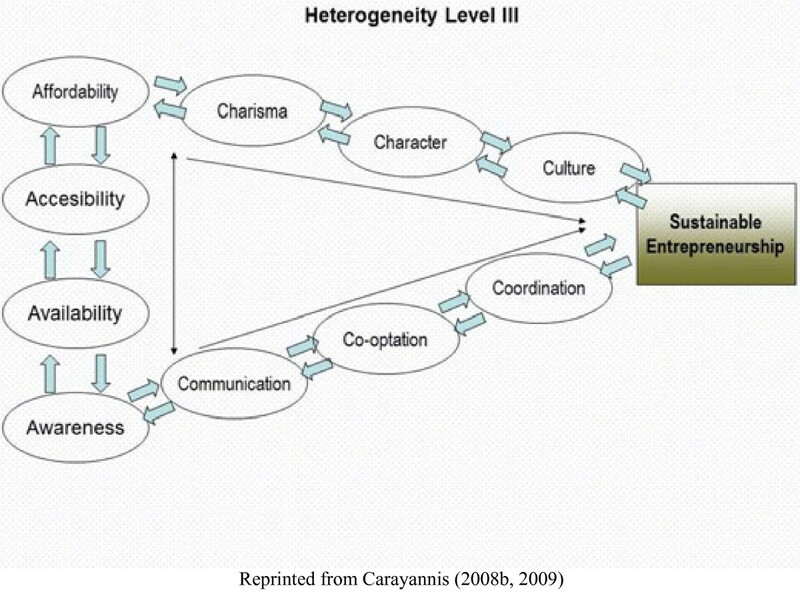 The explicit objective of this component is to identify and illuminate the intrinsic characteristics of entrepreneurial actors and their actions, building and enriching a common vocabulary within the specifically narrow emerging field of Technology Entrepreneurship, and informing the scholarly framework of Technology Entrepreneurship toward a unifying grounded theory. This research attempts to establish some critical factors attributable to the entrepreneur as the originator of new organizations of economic creation and control, specifically investigating what defines and distinguishes an entrepreneur. The analysis and findings from the data processing methodology permits the remolding of the data into an interpreted grounded theory of the entrepreneur, summarized in Tables 1 and 2. By the qualitative nature of the origin of grounded theoretical framework, none of the theme components are afforded any quantitative value, neither relative nor absolute. The grounded theory exhibits that the reported elements are observed and interpreted to be factors salient to the nature of the entrepreneurs. No determination can be made of the degree to which each factor operates in modeling the mechanisms of technology entrepreneurship. This is a limitation of this research, but deeper qualitative interpretation is feasible. What are the qualities and attributes that characterize an entrepreneur in terms of technology venturing? The answer to this research question is drawn from the theme components from the dimensions presented at Tables 1 and 2: Constitution and Behaviors. These 46 themes emerged from the aggregated data analysis to denominate the spectrum of qualities and attributes of technology entrepreneurs that could be observed or reported in the findings from their profile and interview data. One limitation of this research is that data saturation cannot be affirmed; it is unknowable how many additional qualities and attributes might be ascribed given additional data, but this research supports these 46. When, how and why are the specific attributes of “obsessed maniac” and “clairvoyant oracle” (Carayannis and Gonzalez 2003; EG Carayannis, 1998–2011, unpublished lecture notes) observed? To address this inquiry requires the construction of a linkage between the grounded theory interpreted from the findings and the meanings ascribed to the terms drawn from the literature, ‘obsessed maniac’ and ‘clairvoyant oracle’. Beginning with an abundance of dictionaries and looking to each word alone, the researcher must impose interpretations on these resources, as well. Assimilating several sources, the term ‘obsessed’ might be best described as ‘possessing a compulsive preoccupation with a fixed idea’. This researcher suggests that a concise connotation of ‘maniac’ is ‘one possessed of an excessively intense enthusiasm, interest, or desire’. ‘Clairvoyant’ distills to ‘having acute intuitive insight or perceptiveness’. An ‘oracle’ in its most generic connotation is a person who can offer wise counsel or prophetic opinions. These terms do not seem to apply in their entirety to the majority of research subjects in this study. Themes are found that correspond in varying degree to the theoretical constructs of obsessed maniac or clairvoyant oracle but very infrequently are these attributes all found in the same entrepreneur. Of these suggestive themes, there is also a spectrum of manifestations, such that one entrepreneur's data qualitatively indicate a more extreme degree of one attribute than another, but assessing the degree of thematic factors is beyond the limitations of this study. To get as far as we did, I spent a great deal of time and energy, traveling, days away from home, 60-hour work weeks from Sunday evening to Friday night. It’s so all-consuming—you’re spread so thin. At the outset you literally are always working on it, substituting human capital for the thin financial capital—that’s why it’s called sweat equity. The mind is focused on this one thing. Friends who have not participated in starting a business won’t understand and think you are obsessed. You have to be obsessed to build it—you have to be! I tend to be a perfectionist and probably should have released the product sooner. I always got everything to go the way I thought they should. This is the most difficult time of my life—I am a doer and I can make people do things, but if I can’t I feel I have failed. On day one I had no clue where I was going with this, but I just did not want to quit. I had been in another golf equipment company that went broke, but I couldn’t bear to walk away. It wasn’t easy to test ideas dealing with hardware—I went too much on ‘gut’ about what the market wanted and what we could do technically. Perhaps more market research for real testing would have made sense, but ego is a massive fuel and a real bad drug. The market can call your baby ugly but you don’t want to hear it, and then you react like you’ve picked the wrong customers before admitting that you’ve built the wrong product. Personal sacrifice? Just to put it in perspective, I have no life. On Facebook I’m engaged to my company. No health problems, but I’ve gained about 40 lbs. It’s difficult to talk about anything outside the company. No strained relationships because there aren’t any. During Subject G23’s “most” entrepreneurial days (first venture), the time and personal commitment required for the business put such a huge strain on his personal relationship (his marriage) that it resulted in a divorce. It also permanently destroyed his relationship with his first partner (his best friend). Subject G2 learned three very important lessons from this episode. Lesson number one was that regulators are concerned with only two things, keeping their files straight and keeping their jobs. The only way to get their attention is to threaten one or the other. My team was part of a smaller subcontractor hired to build hardware. After the original contract ended, I left with the intent to start a company and hire another CEO because I did not have any specific business experience, but I was appointed CEO by the founding team. Opportunity comes from a whim or a notion of, “Hey! I’d like to be able to do this.” But does anybody else want it, do you care about it enough to make it happen—and make it last? Do you have the passion and the commitment? A startup is like having a child. An obvious thing to say would be that my best moment was the sale of the company. That was nice, but the best thing was between flop 1 and flop 2—we were going to partner with another group. I had $20 k left and $20 k payroll coming up and then the teaming partner sent a letter backing out. My stomach dropped. This was the death knell. I drove home and cried and told no one. After a sleepless night I called a big competitor and their CEO asked how soon could I make a proposal to his Board? I went to California on no sleep for days, but then landed a $6 M licensing deal which changed everything back to right again. This was the crowning glory—to be out on the edge of the cliff, even to fall—but then I caught a branch on the way down! The contract laws that ultimately resulted in my forced sale and all that was involved was debilitatingly stressful. I don’t care to relive the details. Many subjects exhibit a flair for communicating with enthusiasm their beliefs in their venture propositions and intrinsically recognize the imperative for coalition-building, team-building, and strategic alliances as prelude and in parallel with selling their products or services. The interpretation of this theme is that the entrepreneur foremost is selling himself or herself, then in succession, selling the venture concept, the business relationships, and then finally the business deliverables. Entrepreneurship involves making countless promises: promises to make things happen, promises that plans can be made to work out, promises to solve technical problems, and promises to pay or repay quantities of cash in exchange for the faith in the entrepreneur's ability to deliver on all of these simultaneous promises. Often, the ability to deliver on any one promise is a function of being able to deliver on them all. The venture initiation becomes real when these promises become binding contracts. The system of interdependencies the entrepreneur constructs is also dynamic, comprising many other actors and factors over which the entrepreneur may have little control beyond the power of persuasion - to persuade others to make things go or conversely perhaps to persuade them to sit still and not run off until other things can be made to happen. Growing up in communist regime, Subject G3 longed for being able to practice journalism in a censorship-free environment. This aspiration became possible when he relocated to North America. While screening opportunities, he took notice of the emerging Internet and clearly saw the full potential of this new communication tool. According to G3, the majority of media professionals in mid-1990s considered the Internet ‘fourth medium’, inferior to TV, radio, and newspaper. G3 on the contrary, regarded the Internet as ‘first medium’. The reasons are twofold. First, the Internet not only has the individual power of newspaper, radio, and TV but it also can combine their individual effects—prints, sound and vision—in a single platform. Second, the Internet is superior to these media because it can reach far greater number of people at a relatively low cost. … One critical factor contributing to G3’s company’s success is its strategy to preempt and dominate the Internet news service before its competitors. The timing was perfect. When the company was founded, most of its target customers had noticed English on-line news but could not find comparable service in Chinese version. We had lots of cash flow problems beyond our control, and I had to keep personally investing out of pocket to pay bills. During expansion phases—hiring and buying stuff before money comes in—it is a little hairy. We have been self-capitalized and bootstrapped, and I’ve put more in from myself if there were shortfalls. I’ve taken no outside sources of capital. The only advice Subject G24 could give to an aspiring entrepreneur about financing is that you will “mind the store” a whole lot better if it is your own money at risk – and not someone else’s. This research constructs a thematic grounded theory of the technology entrepreneur, specifically looking for - and finding - evidence of the descriptors obsessed maniac and clairvoyant oracle. To investigate our premise, we conducted comprehensive surveys and interviews with 33 founding entrepreneurs, comparatively analyzing their experiences against complementary data sources to develop personal profiles of critical attributes and behavioral characteristics. Employing qualitative analytic techniques, we find the data rich in empirical evidence to support a perspective of entrepreneur as obsessed maniac and clairvoyant oracle, plus many other intrinsic characteristics of personality, motivation, intention, and action that constitute the entrepreneurial actor. This research has provided an emerging and empirically validated conceptual platform for envisioning and then enacting key constructs of what triggers, catalyzes, and sustains entrepreneurial thought, choice, and action. These constructs are built around the key concepts of strategic knowledge serendipity and arbitrage (also known as SKARSE™), higher order technological learning, and fractal Mode 3 innovation ecosystems, as well as co-opetition, co-evolution, and co-specialization processes, all helping profile, diagnose, and predict the behavioral attributes of the technology entrepreneur as an obsessed maniac and a clairvoyant oracle. Primary data was collected from surveys and interviews with a specifically targeted subject pool of technology entrepreneurs. Supporting data was drawn from a collection of entrepreneurial profiles and interview reports prepared by graduate students in business venturing and entrepreneurship classes, following open-ended templates of suggested interview topics. Literature review data was drawn from published sources: biographical and historical accounts of publicly known entrepreneurial individuals obtained by extensive library research. In technology-driven businesses, the profit is fully dependent on the creation or implementation of new technology (Sipp 2011) or innovations in the use or deployment of existing technology. Technology-driven firms compete to produce the technologies to sustain and advance their customers (supply side) (Carayannis and Formica 2008). In this latter perspective, the term ‘supply side’ denotes that the firm operates on the supply side of commerce - developing, implementing, and selling technology. In a technology-based business, the profit is enabled and supported by technology, but technology itself is not necessarily the product, service, or experience being sold (Sipp 2011). Technology-based firms depend on the adoption and use of technologies produced by other firms (demand side) (Carayannis and Formica 2008). In this latter perspective, the term ‘demand side’ denotes that the firm operates on the demand side of commerce - buying, adopting, and utilizing technology. For the definition of this research, entrepreneurship entails all phases of conception, planning, implementation and startup. Franchisees who are not really entrepreneurs but contract to an existing business formula. Open-ended interviews were conducted under confidentiality agreements with 33 technology entrepreneurs vetted against the above criteria. Four of the subjects were serial entrepreneurs who reported multiple ventures, for a total of 38 ventures. Of this primary subject pool, interview questions (a) through (j) were asked as follows. Would you be willing to describe in depth your experiences that led you to give your answer to [specific question(s) asked in the foregoing EPS Form (1) through (15)]? With respect to your reported experiences, how do you define success and failure? What are the characteristics of outcomes that you see as unacceptable in terms of what you originally set out to accomplish vs. what really unfolded? Can you recall examples of intentional strategic preparation and planning and in terms of people, connections, knowledge, processes, or any other factors that impacted the course of your business venturing? Can you recall examples of unexpected ‘happy accidents’ in terms of people, connections, knowledge, processes, or any other factors that impacted the course of your business venturing? How much of your specific experience in this venture seemed like it was excessively beyond your control? Which parts and in what ways? Were there instances when try as you might, you simply could not make things happen the way you thought they should? Were you ever driven to drastically alter or compromise your plans, your perspective, your standards, or your commitments in the name of the larger mission and would you be willing to share examples? Anything illegal/unethical/or even just bothered your conscience? How were you cheated? Are you willing to relate the gaps or ‘white space’ in your target market and comment on the validity of your expectations, and elaborate on how the venture development played out, with what adjustments? In terms of both your positive motivations and determination to surmount obstacles, could you elaborate on your persistence and drive? Were there personal sacrifices, and if so, of what nature? Were you able to accomplish what you set out to do? Any damaged relationships, personal regrets, health problems? What do you recall most favorably about your entrepreneurial experience? Was it worth it? Would you do it again? On the whole, subjects were very willing to candidly discuss their experiences. Although no subjects dropped out mid-interview; a very small number simply declined to respond to certain lines of inquiry, but it was much more often the case that a subject would spontaneously reveal private facts without prompting. All interviews were transcribed to word-processed files as originally recorded, then verified by a separate proofreader. Historical background of founding entrepreneur and of entrepreneurial venture - what were the overarching motivations and trigger events along with any long term planning - what were the facilitating and the impeding elements? Business plan development, idea screening and opportunity recognition, including evaluation of alternative ventures and business ventures. Analysis of sources of venture financing (personal/family funds - friends, family and fools, angels, venture capital, strategic alliances, SBIR/SBDC funds, other private/public funds) - what worked for the entrepreneur or not, why, how, and when? Analysis of essential venture business functions - marketing, finance, manufacturing, brand management, fund raising, customer management, employee recruitment, training, and retention, competitive intelligence, strategic alliances, etc. Lessons learned and critical success/failure factors in venture initiation and development - would the entrepreneur do it again and in the same way or differently - when, how, why, with whom, for whom? Other pertinent venture lifecycle issues per the entrepreneur's perspective. Other issues at the heart of the matter - what insights do the entrepreneur volunteer unasked - what might be considered surprising? The biographical data consisted of 64 compact published articles from library sources covering 20 technology entrepreneurs, vetted against the same criteria for inclusion or exclusion. The researcher visually parsed each word-processed interview transcript, narrative report, and biographical article to flag key points of data and information, and to develop categorical codes from the words and concepts found within the data text (thematic coding). A statement of meaning that runs through all or most pertinent data. One in the minority that carries heavy emotional or factual impact. Working back and forth between the coded text excerpts and the concept dictionary, the researcher consolidated thematically comparable passages from the data into the resultant categories, grouping the excerpts to produce tables of evidentiary text in a Data Book that supports the thematic categorizations (thematic analysis). The researcher performed cognitive, interpretive assessment and evaluation of findings to formulate inductively the interpreted insights by comparing and contrasting the multi-dimensional factors of the 33 different primary subject profiles, 26 supporting subject profiles, and 20 biographical subject profiles (grounded theory-building). EGC structured the triangulated research methodology, composed the majority of undergirding theoretical foundations, formulated the conceptual construct of entrepreneurs as “obsessed maniacs” and “clairvoyant oracles”, targeted the preliminary pool of live entrepreneurial subjects, enabled access to the GEFRI interview archives, and provided technical and editorial guidance. MRS authored the background and summary literature review, parsed and compiled the entrepreneurial profile data from previously published sources, vetted and abstracted the entrepreneurial profile data from the GEFRI interview collection, contacted and interviewed the live entrepreneurial subjects and transcribed the data from those sources, subselected and catalogued the thematic coding from all data sources, and consolidated the aggregated findings. Both authors read and approved the final manuscript.